Omnimed® Ambi-Top Wall Storage Cabinets Provide Locked Storage Of Pharmaceuticals, Medical Supplies and Patient/Resident Personal Belongings. Omnimed® Ambi-Top Wall Storage Cabinets are constructed of heavy gauge steel for long lasting durability. Omnimed Ambi-Top design allows for left or right hinge mounting. Offers flat key lock flat key (3 keys/lock) or thumb latch closure. Multiple cabinets orders keyed the same unless specified. Colors are Beige and Light Gray. Number of adjustable shelves are 1 and 2. Sizes are 9" W x 4" D x 12" H, 16" W x 4" D x 16-3/4" H and 16" W x 8" D x 26-3/4" H. 5 year warranty on cabinet and 1 year warranty on locks/keys. Stainless Steel Wall And Counter Height Cabinets Feature Paddle Locks To Secure Supplies For Laboratories, Medical Facilities And Other Storage Applications. Stainless Steel Wall And Counter Height Cabinets are made using fully-welded stainless steel for lasting durability and resistance to corrosion. Counter Height Cabinets are available in several dimensions and hold up to 400 lbs. (evenly distributed). Wall Cabinets include two shelves that adjust in 2" increments and hold up to 400 lbs. 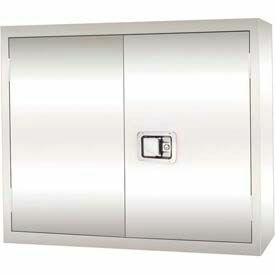 Wall cabinets feature stainless steel recessed paddle locking handle. Additional Shelves sold separately. Dimensions vary per model. Omnimed® Patient E-Lock Wall Storage Cabinets Provide Secure Personal Storage For Patients. 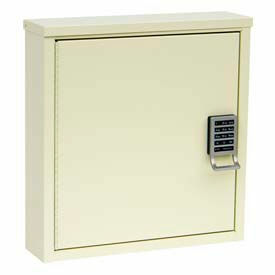 Omnimed® Patient E-Lock Wall Storage Cabinets are constructed of heavy gauge steel for long lasting durability. Provides a non audit digital reprogrammable lock. Electronic lock uses 1 AAA battery (included) and has a battery failure override. Single shelf and locking door allow for safe holding of personal items. Colors are Beige, White and Light Gray. Some models have 1 adjustable shelf. Sizes are 7 1/2" W x 4" D x 10 1/2" H, 16" W x 4" D and 16" W x 8" D x 16-3/4" H. 5 year warranty on cabinet and 1 year warranty on locks/keys. Harloff In Room Resident Medication Cabinets Are Used For Medical Offices, Laboratory Equipment, Hospitals Or Other Health Care Facilities. 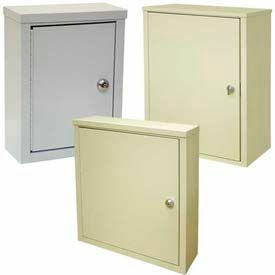 Harloff In Room Resident Medication Cabinets are made of painted steel for long lasting durability. Designed for in wall stud mounting. Drop down shelf provides medication preparation area. Painted double thick door with overlapping edge ensures security. Slam lock allows for one hand open and close. 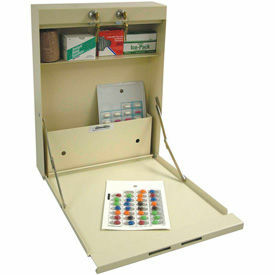 Capacity of 40 punch cards / liquid storage and multiple cabinets may be keyed differently or alike. Stainless steel pinned door hinges prevent pin removal for additional safety. Predrilled holes and hardware included. Available types include In-Wall Cabinet - Double Security Door Painted/No Trim, or In-Wall Cabinet - no trim. Standard color is Gloss Beige. Harloff Wooden Laminate In Room Resident Medication Cabinets Are Used For Medical Offices, Laboratory Equipment, Hospitals Or Other Health Care Facilities. 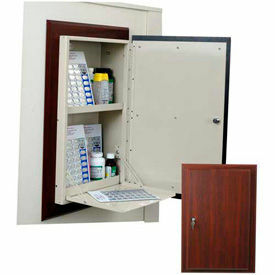 Harloff Wooden Laminate In Room Resident Medication Cabinets are made of painted steel for long lasting durability. Door is MDF panel covered with a special heat-pressed thermal foil laminate with a wood appearance for in room storage solutions. 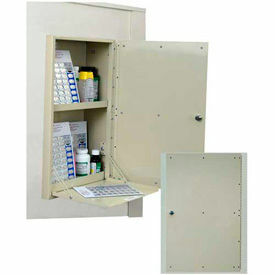 Recessed panel, internal locking narcotics box in top half of cabinet and Drop down shelf (No Pill Crushing) provide user convenience and content security. Capacity of 40 punch cards and liquid storage or treatment storage. Modular construction allows multiple cabinets to be keyed differently or alike. Stainless steel pinned door hinges prevent pin removal. 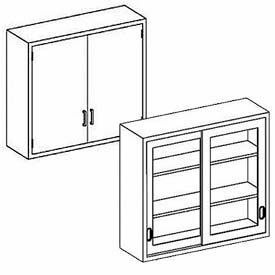 Predrilled holes and hardware included Available types include Exterior Wall Mount Cabinet - small, regular or narrow, In-Wall Cabinet w/Decorative Trim, In-Wall Cabinet with Keyless Mechanical Lock and Trim, and In-Wall Cabinet w/Trim. Available color finishes are Dark Cherry or Solara Oak. Blickman Wall Medical Cabinets Are Used For Storing Hospital, Medical Center And Treatment Area Supplies. Blickman Wall Medical Cabinets are made of stainless steel for long lasting durability. Designed for flush face construction with a recessed back panel for uneven wall surfaces, the solid doors are double walled for added strength and sound deadened for optimal performance. Sliding doors ride quietly on noiseless ball bearing rollers. Dimensions vary. Door types include Solid Single Door, Glass Door, Open Front , Solid Double Door , Glass Double Door, and Glass Sliding Door in 2 or 3 shelf quantities. Constructed of durable, heavy duty powder coated steel. Dual collapsible hinges on the door and fixed shelf for storage. The base of the cabinet also has an integrated pocket for additional storage capacity. Double flat key locks the top of the cabinet are keyed differently to promote content security. Unit is warranted for 5 years with 1 year on the locks.